Don’t be “Shellfish” this Valentine’s Day! Northumberland has a long-standing and highly valued commercial lobster fishery, which is a vital part of the local economy and plays a key role in us having sustainable coastal communities. In addition, many people like to catch the occasional lobster themselves, with lobsters being widely considered as a dish for special occasions. Being such an important part of the marine environment and with the aim of ensuring the long-term sustainability of the stocks, it is important that there is an understanding of the rules which apply to catching lobsters recreationally as well as commercially, which is where Northumberland IFCA comes into the picture. So, if you are planning a romantic lobster dinner this Valentine’s Day, make sure you know the dos and don’ts for catching and landing lobsters in Northumberland as a hobby or recreation (apart from what applies to commercial fishers). When fishing with pots, creels, traps or cages recreationally, you need a Northumberland Inshore Fisheries and Conservation Authority (NIFCA) Recreational Shellfish Permit. The permit costs £10 per year and allows you to fish up to 5 pots and catch up to two lobsters per day. Each pot must be fitted with a valid NIFCA tag and an 80mm x 46mm escape gap. You do not need a permit for collecting lobster while shore gathering (including cleeking, angling and diving) but you are only allowed to take one lobster per day. 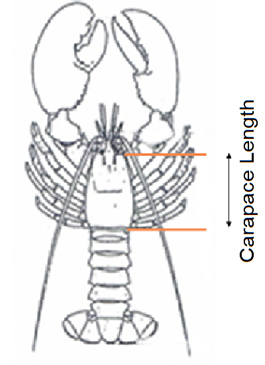 All Shellfish Permit holders and hand gatherers are prohibited from taking: berried (egg-bearing) lobster; lobster with a v-notched or mutilated tail; soft shelled lobster; detached parts of lobster and lobster with a carapace length under 87mm. NIFCA hopes everyone enjoys being able to catch a lobster and as part of a lovely meal! Please contact the NIFCA office or visit www.nifca.gov.uk for more information. 2 thoughts on "Don’t be “Shellfish” this Valentine’s Day!" Robert Nelson uses the term “license” whereas we refer to a Permit and if he is not using a pot creel, trap or cage, then he does not need a NIFCA Permit. If he is returning crabs to the sea then there is no NIFCA restriction on this activity. If he is keeping any brown or velvet crabs however, then there is a daily limit of 5 in each case which he may take. If he wished to keep any green crab, then there is no NIFCA restriction upon the numbers he may take. Further details can be found in the Authority Byelaws which can be seen on our website at http://www.nifca.gov.uk.